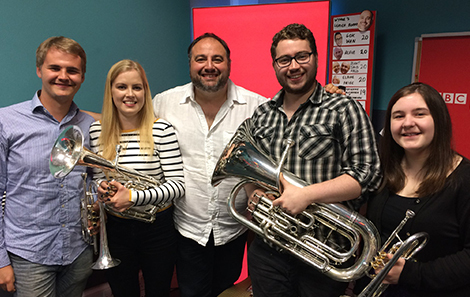 RWCMD musicians helped BBC Radio Wales celebrate BBC Music Day last week, with live performances from two College quartets. 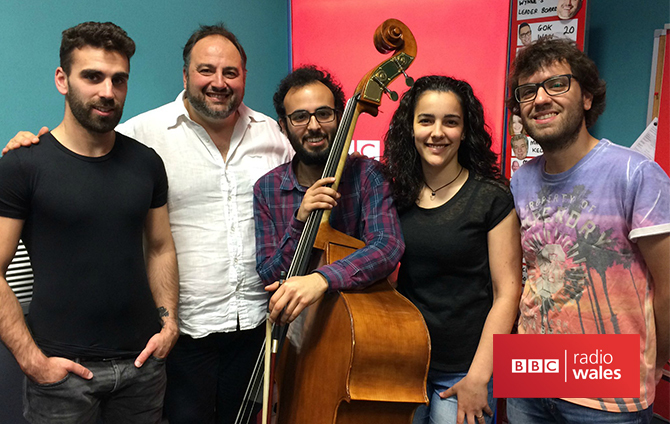 Eight students, comprising of Indigo Brass, a brass quartet, and 1+3, a Portuguese and Brazilian Jazz Quartet, featured on the Wynne Evans Show for a day of live music. This year the theme for the annual celebration was the power of music; celebrating how music can bring us together, make us feel fantastic and create unforgettable memories. Turn your sound up and listen to Diogo, Inês, Matheus and Pedro perform as 1+3, recorded at the studios. Any guesses who can hold the longest note between Wynne, Inês and Gareth?